Learning to cook is a great way to take charge of your own health: when you cook meals from scratch, you’ll know exactly what’s in them and all the wholesome ingredients you choose to include. Some foods you’re more likely to buy ready-made such as breakfast cereal, bread, canned soup, yogurt, crackers, and snack foods. It’s important to look at what’s in them and to teach your children to look too, since ideally they’ll grow up to choose foods that are full of “good for you ingredients” that help their bodies grow and stay healthy. What Foods Get a Nutrition Label? 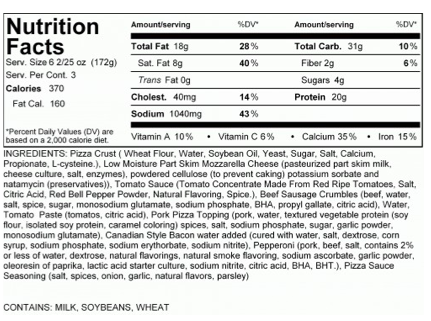 Processed food usually comes in bags, cans, jars, boxes, or other containers and is required by the government to have an ingredient list on the label. The list tells you what the food is made of and shows the ingredients included in order of quantity from most to least. Look for whole-food ingredients at the start of the list. If you see white flour, sugar, or high fructose corn syrup at the top of the list, that’s a red flag telling you that the food isn’t wholesome. Many of the healthiest foods don’t need ingredient lists because they’re “whole foods” foods that haven’t had anything added to or taken out of them, such as fruits, vegetables, nuts, eggs, fish, and whole grains like oats and brown rice. Most plain dairy products are wholesome too. Milk might have added vitamins, and plain yogurt is simply milk with good bacteria added to it. These tips are provided by nutrition expert, Noni Robinson of the Robinson Nutrition Group.